When Voridian Columbia Operations, a division of Eastman Chemical Company, decided to go paperless using ProCalV5, a calibration management system from Prime Technologies Inc., its intention was to optimize a lean calibration staff. "I've been to our calibration shop on a number of occasions, either as part of a customer visit or audit, and have had a chance to observe our use of the software," says Brian Lander, manager of quality assurance for Voridian. "It offers a number of benefits. "Calibration reports show the test instrument used and reference the current calibration status of the test instrument. Reports are easy to save and e-mail as PDF files, which has cut down on the amount of paper we handle. "We are able to link our specific procedures, which are stored on a local server, to the information used when calibrating instruments. In addition, the system interface is extremely flexible, which allowed us to have the software fit our existing processes rather than having to rethink our processes to fit the software. Calibration records are easy to retrieve in several different ways." Calibration management software is a key element of the Voridian calibration lab's ISO 9001 quality management system. The flexible and intuitive data retrieval and reporting capabilities, along with electronic data collection, helps Voridian make its lean calibration staff completely effective. "Our centralized shop is subject to examination in any internal, customer or third-party audit," says Landers. "Auditors now leave the calibration lab very satisfied with the effectiveness and efficiency of our calibration processes." Whether your quality practices are guided by the need for compliance with the Food and Drug Administration, ISO 9001 or ISO/IEC 17025, a calibration management software solution can be an important central element of your integrated quality system. Properly implemented, the right software will provide benefits that include stronger compliance controls, daily productivity gains, improved communication and better process control. Even if you are fortunate enough to have one of the better computerized maintenance management systems, such as SAP plant maintenance (PM), DataStream, JD Edwards or Maximo, they fall short when it comes to understanding or addressing the unique demands of the metrologist. Calibration is not just another planned maintenance activity. Normal planned maintenance helps to ensure resource availability and reliability, but calibration management does more and is often more technically rigorous. Communication and the management of acceptable process or device specifications are critical. A professional calibration management solution will readily cope with these demands. The instruments, gauges, devices and systems that require calibration are as varied as their functionality. Their respective signal types or engineering units of measure are virtually unlimited. Input and output accuracies may vary over the device range. They may be based on percent of range; percent of reading; percent of reading range, plus or minus; or a combination of these. You will want to document the manufacturer's specifications, and you will also want to define the performance or control specification as the required performance objectives for the item you are planning to manage. Ideal test point values with allowable variances will aid the technician to more quickly accomplish the assigned calibration. The system should automatically recalculate the acceptable performance levels based on the actual test value and immediately inform the technician of an unacceptable result. Subtle performance variations can directly affect product quality. Regardless of what your company produces—food, beverages, chemicals or pharmaceuticals—the recipes and processes that produce them have been developed to achieve a desired result. Ingredients, quantities, process temperature, pressure, etc. need to be reliably controlled. If the instruments controlling the process are not operating correctly, the product may fail to deliver the expected result, be it taste or efficacy. The risk of noncompliance, poor quality and even civil liability is higher than with other maintenance activities. When you are evaluating your calibration management needs, asset management is a good place to start. The system record should be able to document the complete life cycle of the asset, be it an instrument, device, gauge or system. The scope of the information managed is dependent upon the nature of your relationship with the asset. Simply put, if your business is responsible for providing only metrology or calibration services, your records may fail to include the establishment and documentation of instrument specifications for acquisition and validation. As a calibration service provider, you will often be presented with your client's asset detail and calibration specifications. Although the extent of your responsibility is governed by your service agreement, with a good calibration management system the level of detail, and the ease of information retrieval and subsequent evaluation, will help enrich the quality of your professional services. The identification of issues less obvious than calibration failure can include trend analysis, potential-problem recognition or opportunities for improving calibration practices. All represent opportunities for you to provide better service and to reinforce your relationship with your clients. Calibration software should support complete details of the asset, including the manufacturer's specifications, as well as the process or performance specifications. It is the logical center of activity records related to the asset—approvals, validation, maintenance and calibration. Look for software that will allow you to document all of the characteristics, regardless of complexity. It is not an uncommon necessity to establish a variety of planned activities for a device, and the solution you select should accommodate this. 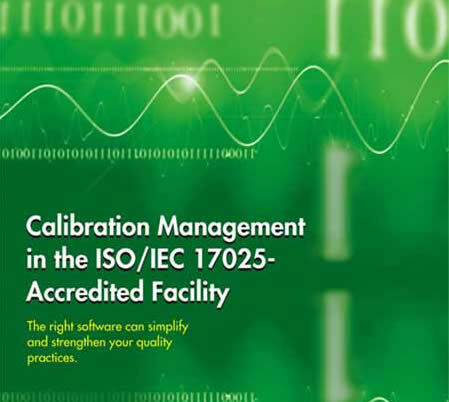 Calibration, validation and maintenance procedures must be documented, approved and managed. Although many already have some form of electronic quality procedure management, the ability of the calibration management software to access these documents or, alternatively, to allow the user to publish the procedures within the calibration software application, is a valuable feature. To demonstrate compliance, it's imperative that the system be able to reflect these documents in the records for all assets and their related activities. The more complete and accessible your documentation, the easier it is for those who will use it, and the higher degree of confidence instilled in auditors, be they internal staff, as per FDA 21 CFR 820.22, or from your customer or a regulatory authority. If you want to avoid receiving an FDA 483 warning letter, be prepared to demonstrate well-documented procedures and practices in compliance with FDA 21 CFR 211.68 and FDA 21 CFR 820.72. Technicians, managers and administrators must be trained, their competency to execute the procedures documented and their periodic retraining proactively managed. Incorporation of this in the system you select can greatly simplify management of this often-overlooked quality and compliance element. These requirements are increasingly being carefully audited and are clearly specified for ISO/IEC 17025 accreditation or FDA 21 CFR 211.25 compliance. The test standards utilized to perform calibrations, validations, and testing must be managed and controlled as strenuously as all other assets. Additional software functionality to automatically communicate suitability for use, the uncertainty contributor of the standard and reverse traceability are all features that will provide additional benefits and efficiency to your integrated quality system. Always a consideration of any calibration activity, easing the burden on the technician and the manager through prequalification and proactive system control will eliminate invalid calibrations and wasted effort while simultaneously enforcing best practices and quality policies. The greatest gains in productivity and quality control are realized with the implementation of paperless calibration techniques. A recent calibration management software implementation at a major pharmaceutical manufacturer showed calibration productivity improvements in excess of 200 percent, and nearly 100-percent on-schedule calibration activities without any reduction in performance confidence. Users are immediately and reliably presented with the correct performance specifications and the approved procedure for the item under test. Positive management and quality practices control the schedule as well as the process. The system, not the technician, performs the calculations necessary to determine acceptable or unacceptable performance. When selecting calibration management software, look for a solution that will not only allow you to manage simple input-to-output (i.e., direct) correlation routines, but will also provide features to execute more complex performance algorithms. Simple devices like gauges or thermometers may represent the majority of what may need to be calibrated. The time and effort necessary to calibrate a complex device or system will typically represent a disproportionate amount of time to complete and represent more opportunities for technician error. Users of professional calibration management systems are offered standard or custom test procedures that prompt the technician for what reading is to be taken and then automatically evaluate the recorded result, determining performance acceptability regardless of complexity. No matter what your current practices are, you should look to likely future requirements. One example is the determination of calibration uncertainty. Already a requirement under ISO/IEC 17025, in the world of constant quality improvement and competition, your company may decide on the practice to present a qualification or differentiator to your clients. An automated tool to assist managing this more complex practice will greatly simplify the task for you and your associates. The calibration program should be capable of automatically evaluating all the uncertainty contributors, including the coverage factor, and determining the combined budget, consistent with ISO Guide 98—"Guide to the expression of uncertainty in measurement" (GUM). You should be able to configure the software to automatically initiate a wide range of functions based upon the results of the calibration. With a successful calibration result, automatic program functions will satisfy the scheduled calibration and advance to the next date based on the planned interval. If a work-order management utility is being utilized as well, the task will be satisfied. On the other hand, should the device be found out-of-calibration or fail, the options get more interesting. These can include electronic notification of the failure to appropriate staff as defined by the classification, criticality or other defined business logic; the automatic launching of system-generated repair/replace requests; the initiation of quality/compliance incident reports that will become the basis of a corrective and preventive action (CAPA) investigation; and more. Regardless of the circumstance, re--cording the actual calibration data will simplify evaluation and analysis. The ability to readily retrieve and evaluate historical calibration results can save time for the engineer and quality professional. With manual systems, the investigation and review of historical data can easily represent more than 35 percent of the reviewer's time. Another impediment to quality reporting and improvement is communication. A solution that supports flexible paperless routings for change control, approvals, quality and compliance incidents can justify the investment in a new solution. A better solution will address communication and notification comprehensively. Alerts, reminders, notifications and incident reporting should all include the ability to communicate to defined responsible participants external to the application itself. Finally, no matter how attractive the promised features and benefits may appear, you should consider the qualifications of the solution provider. Whatever solution you select, keep in mind that you will be dealing with critical business practices. Take the time to look into the vendor's experience, support services, track record of success and quality practices. Is the company prepared to withstand your scrutiny of its design and testing practices? Inquire about the maturity of the product. If you are working in an FDA-regulated environment, ask if the vendor can demonstrate validation qualifications. Ask for contact references and call them; it's important to work with a flexible vendor willing to address your special needs. Look carefully at what the vendor can actually demonstrate and weigh it carefully against your critical requirements. Remember, anyone can promise vaporware, and many do. Bernard Williams is director of sales engineering and consulting for Prime Technologies Inc. Williams is an executive with more than 30 years of engineering and management experience with leading-edge technology companies. He has worked in such diverse fields as power generation, holography, analytical chemical systems and process automation. For the last 10 years, Williams has worked with Prime Technologies Inc. as the senior technology consultant and contributor to the development of its ProCalV5 computerized calibration management solution.